A visit to Fife for a boxing show turned into a nightmare for a West Lothian man, who was assaulted then threatened with a knife. A terrified Donald Mills made the decision to drove home even though he was more than four times over the limit. He was arrested by police after he crashed into a bollard and the incident resulted in him losing his job. 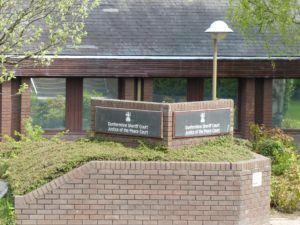 Mills (41), of Langside Gardens, Polbeth, appeared at Dunfermline Sheriff Court. He admitted that on 21st January in Lumphinnans Road, Lochgelly, he drove a car after consuming excess alcohol. His reading was 94 microgrammes of alcohol in 100 millilitres of breath, the legal limit 22 microgrammes. Depute fiscal Alisdair Shaw told the court the incident occurred at 4.40am. Defence solicitor Jenny Simpson said her client had lost his job as a rights officer with a housing association as a result of the offence. She explained, “He had been to a boxing event with a friend and had arranged to stay the night at the friend’s house. “The friend had invited a number of people back to his home after the event. A large amount of alcohol had been consumed. Mr Mills was assaulted by two people and sustained an injured lip. “One of the two males then pulled out a large knife. Mr Mills grabbed his car keys and made his escape as his friend held the door open for him. He fined Mills £300 and banned him from driving for 16 months.